Duncairn Presbyterian Church is a Grade B1 listed building on the Antrim Road in Belfast. It was originally built in 1860-1862 in the High Victorian Gothic Style with adjacent contemporary manse building and (later) halls making up the current site of over 1,689m². 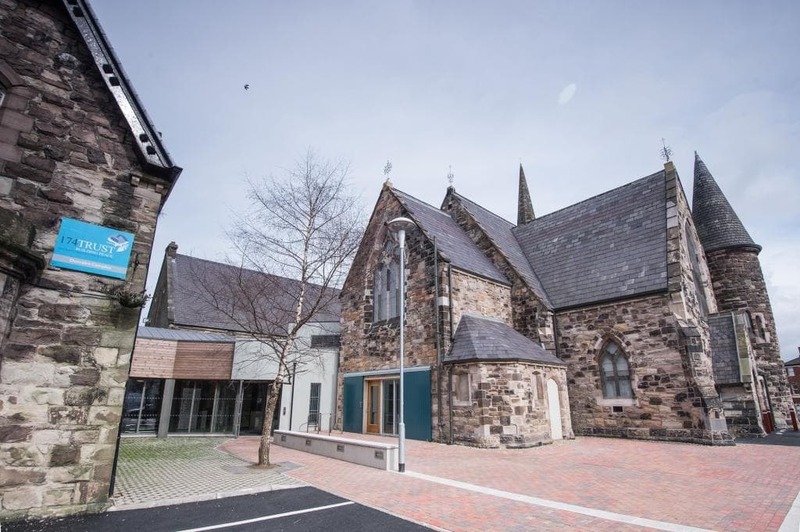 A substantial refurbishment project was undertaken to refurbish the main church and halls and integrate the buildings via a link reception in order to adapt the facilities to their new use as a centre for culture and arts. 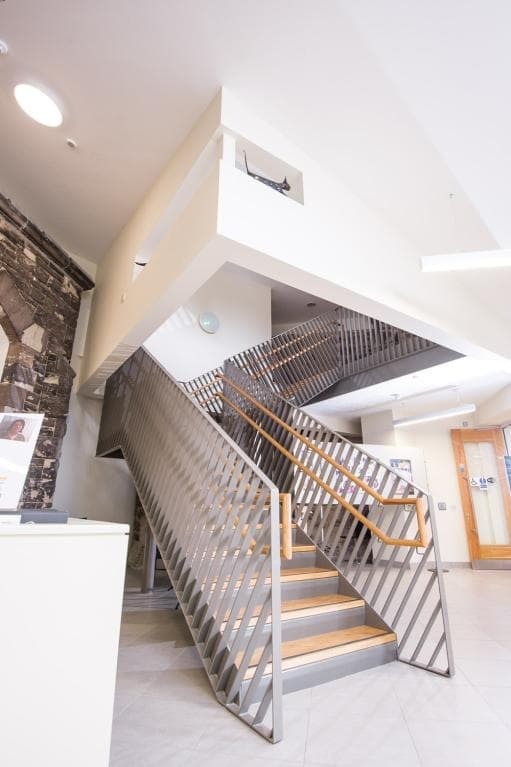 The project was hugely successful and won a RICS Building Conservation award (as well as making the shortlist in the Regeneration and Community Benefit categories) and gained a Special Commendation in the RSUA Building Conservation category. The completed Centre for Arts, Culture and Heritage was developed and is managed by the 174 Trust charitable organisation, providing a community hub with office accommodation at both ground and 1st Floor levels as well as a visitor centre incorporating exhibition and presentation space at 1st Floor levels with cafe and shop. 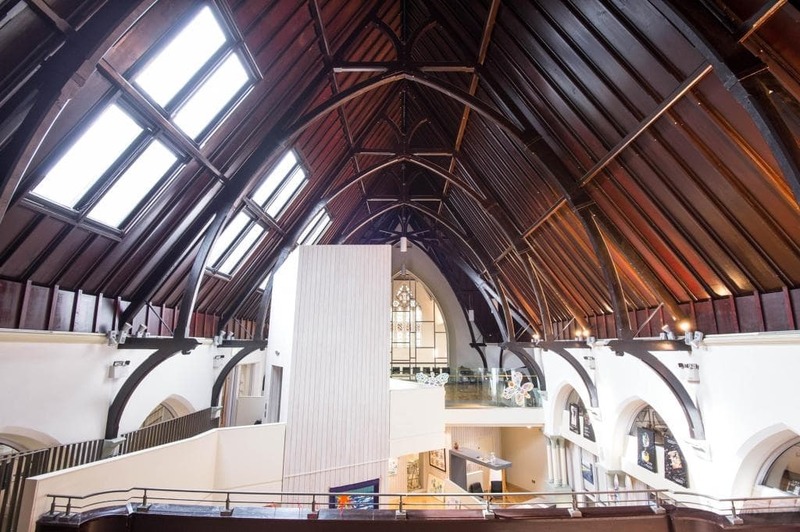 The work to the existing church building was comprehensive and involved substantial structural alterations with a complete temporary works solution to lift and support the roof structure while the existing ornate timber hammer-head trusses were repaired with the bottom 1.2m of each truss replaced and replicated on site. 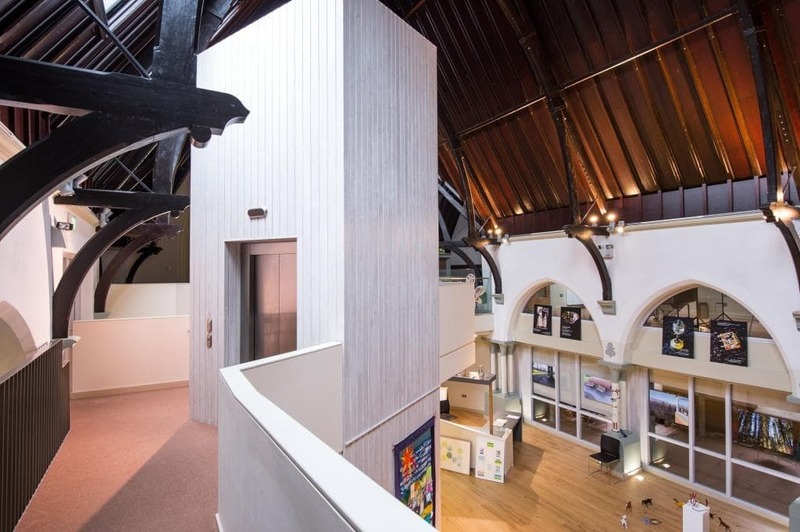 Internal works included underpinning existing walls, new pad foundations and installation of new mezzanine floors supported off independent steel structures (new toilets, stairs and passenger lift facilities were located centrally to the new mezzanine exhibition space). The internal layout was reconfigured to facilitate the change of use and a full mechanical ventilation and heating system installed with new general power and lighting arrangement. An integrated IT system with data, distribution, audio visual and projection technology and AV lighting for displays was installed together with life safety systems all integrated into a new sophisticated building management system. Office areas were tastefully restored and refurbished using a range of MF Ceilings, partitions and bespoke joinery from our in-house joinery workshop. 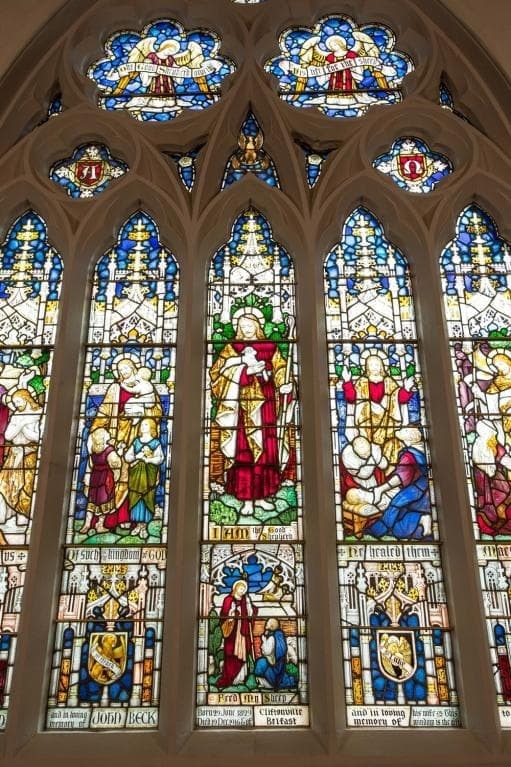 Externally, we undertook a complete overhaul of 5m diameter feature rose windows and existing stain-glass lead inlaid windows and replaced all cast iron rainwater goods. 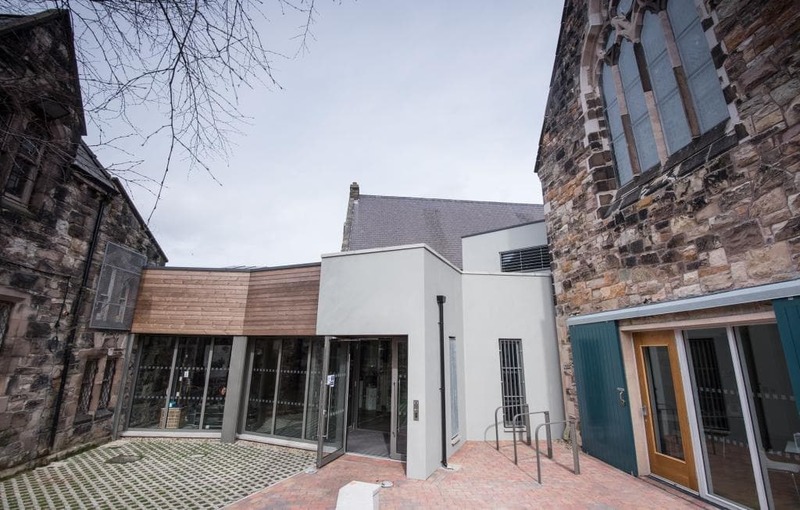 Significant repair, replacement and repointing of the existing Scrabo Stone façade was also completed and a full rainwater harvesting system installed to collet water from the large roof area which services the toilet facility in the refurbished exhibition centre and attached manse building. We undertook comprehensive liaison with the Planning Service and NIEA in relation to the structural alterations to ensure that the details were understood and agreed. 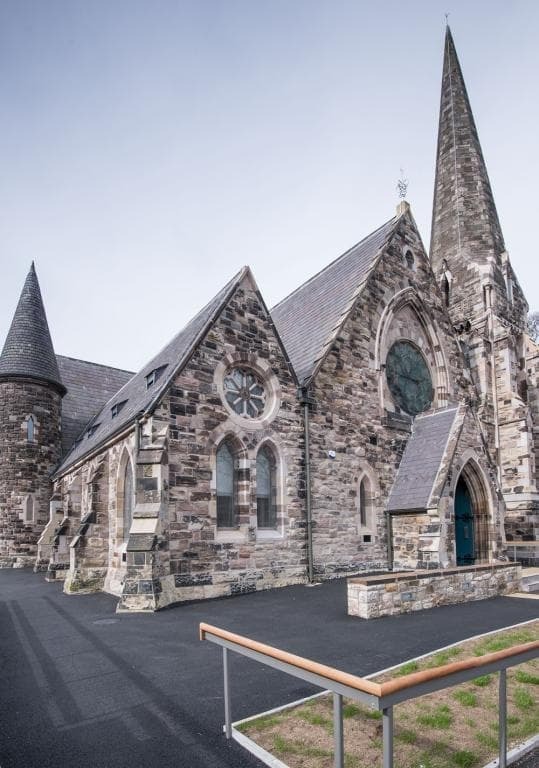 We utilised our integrated Computer 3D BIM model to assist with the identification and retention of material allowing us to identify clearly, any areas where the proposals impacted on the existing fabric of the church. A severely restricted site located in an urban environment close to an interface area bounded by residential properties on three sides created its own issues. We appointed a community liaison manager within our team to communicate our plans and proposal to the neighbours incorporating their concerns into our project delivery plan. This, together with a detail logistic plan, resulted in an efficient and high-quality project which was delivered on time and within budget.